Thank you so much for showing your support for independent artists by purchasing our books and CDs directly from us! Click on the book cover to learn more about or buy each book! 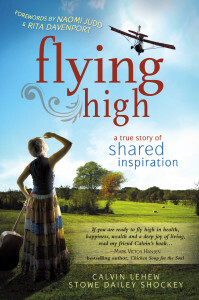 The powerful, true story of Flying High was originally intended to chronicle the amazing life of self-made millionaire and manifest-er of dreams, Calvin LeHew. Remarkably, the writing of it helped rescue the life of his co-author, Stowe as she battled cancer. The result of their experience is an uplifting story for the world, of flying high above adversity—a story of personal growth, a tribute to divine guidance, and a reminder to be who we were born to be. This small but powerful book with it’s companion 14-song CD is used around the world by grief support groups. 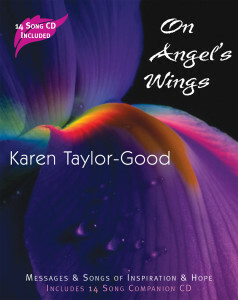 It contains the songs, lyrics, and stories of “Precious Child” and “On Angel’s Wings” – the songs Karen was born to write. It also includes, “How Can I Help You Say Good-bye” and the uproarious “OBG Why Me Blues.” Let these songs and stories refresh your soul!